Someone recommended Evolution of a Creationist to me. It wasn't too expensive, and I needed some motivation to keep up the writing on this site, so I bought it. 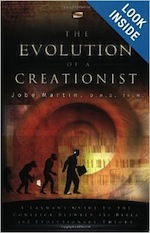 The short review is: this book is as bad as any I have read on the creation vs. evolution debate. The author does at least use "A Layman's Guide" in the subtitle, though he nowhere seems to admit that he himself is a layman when it comes to evolution. If you pay attention, you can catch that Jobe Martin is a dentist who also has a masters degree in theology. He has "D.M.D. Th.M ." next to his name in the title, and he mentions dentistry school in chapter one. Two of my students at Baylor College of Dentistry had challenged me to investigate the possibility that the God of the Bible had created everything in six 24-hour days ... These two dental students were brilliant young men. They held advanced degrees in the sciences. Really? They were dental students at Baylor with advanced degrees in the sciences? I guess that's possible. Someone could go get an advanced degree in some scientific field, then move on to dental school. That's not a usual route to take, however, and nothing in the book makes me feel the author is honest enough to take his word for anything. The author claims that he began his Christian life as a theistic evolutionist. This was not purposeful, but a default place he arrived at. He assumed evolution was true as a non-Christian, and then he became a Christian, so now he was both a Christian and a believer in evolution. Actually, atheists make no such assumption. They don't know what existed before the Big Bang, and virtually every one of them would admit it. But that's not the point. How did atheists come up at all? I thought we were talking about evolution, and specifically about how Dr. Martin moved from being a theistic evolutionist to a young earth creationist? Both theistic evolutionists and young earth creationists believe in God. Why would we be discussing what's logical if there were no God? The reason is that Dr. Martin is subtly shifting the discussion from evolution or non-evolution to atheism vs theism or atheism versus a Creator. At that point the discussion is much easier. Obviously the Bible is going to be on the side of the theist, the Christian. Those who believe in evolution automatically don't believe in God, so it's permissible to argue against atheism and assert that such an argument also refutes evolution. Such an assumption should be hard, even impossible, for a theistic evolutionist to make. I don't believe Dr. Martin was ever a theistic evolutionist. I think the very first time he thought about evolution as a Christian, he already had evolution tied together with atheism. At that point, I'm sure it wasn't very hard to convince him that evolution was false. Theist and atheist both live by faith. My note in the margin says, "So how did this become a theist vs. atheist discussion?" Does it seem right to you, even as a Christian, to have on the evolutionary glasses of the humanistic worldview? Since over half of scientists in the world are Christian or theists of some sort, how does this question apply to his discussion. Yes, many scientists and many non-scientists have a humanistic worldview, but obviously, over half of scientists do not. I do not have a humanistic worldview, and I most certainly believe that evolution happened. In fact, I think it's as "proven" as a scientific theory can be. Believing that evolution happened because of the evidence in God's creation does not require a humanistic worldview. Equating evolution with atheism and a humanistic worldview sure helps with arguing against it, though. Never mind that it's not true. It wouldn't be like an anti-evolutionist to let what's true stand in the way of the point he needs to make. When we speak of origins, neither the creation model nor the evolution model can be tested or verified by reproducible scientific experiments. This is simply not true. There are two gross errors here. The evolution model addresses origins. Origin models cannot be tested or verified by reproducible scientific experiments. Obviously, we cannot reproduce the big bang in a laboratory. Scientists can, however, make predictions that are testable in a laboratory, and they have done that with the Big Bang with astonishing results. Scientists predicted that the Big Bang would have left a "Cosmic Microwave Background" (CMB). The theories that produce that prediction are beyond my expertise and probably yours as well. People go to college for many years to gain that sort of expertise. At the time the CMB was predicted (1948), we did not have equipment remotely capable of sensing such a signature. In 1965, however, we did, and it was found inadvertently at Bell Telephone Laboratories. It was a stunning fulfillment of a daring scientific prediction. Scientific theory builds on itself. It grows and adapts as it accumulates evidence, and evidence has been accumulating from thousands or millions of scientists, especially over the last century. Part of the proof for these theories is the way that evidence from all sorts of disciplines ties together. It is not just direct evidence like the CMB that supports the Big Bang. We also can see the expansion of galaxies, all separating from each other. It's a simple extrapolation back in time that suggest the Big Bang. Even more amazingly, God has given us a window back in time. With telescopes, we can peer at light that has been traveling to us for 13 billion years. At the other end of the universe, galaxies, whose current light won't reach us for 13 billion years, give us a view of the state of the universe less than one billion years after its formation. That view gives us the same impression as the much more current view of galaxies near us. So it's not true that theories on origins can't be tested. But even if the origin of the universe couldn't be tested, it would be irrelevant to evolutionary theory. The evidence from nature today, from the fossil record of nature, and from DNA would still make evolution an unassailable theory. Let's begin by addressing the general concept that Dr. Martin doesn't understand, and that actual scientists like Michael Behe pretend not to understand. Evolutionary theory says that if we don't use it, we lose it. But how do you use it if you don't have it in completed and in fully functional form? This question is asked in reference to the Bombardier Beetle's explosive defense system. 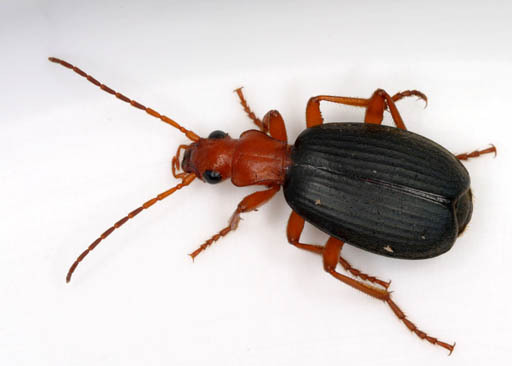 The answer is that the species that preceded the Bombardier Beetle had some portion of the current species' defense system, and they probably used it for something other than defense. The flagellum is a loose tail that rotates in a very motor-like assembly. That's amazing. How could it have evolved? The answer is known. That "motor" consists of just 15 proteins. There is another bacterial species that uses 7 of those proteins to form a venom injector. The injector does not spin, and it is rigid. That species injects other cells with venom to destroy them, then eats their contents. That's an example of a perfect intermediate. "Mr. Behe, at the trial in Dover, Delaware, it was revealed to everyone that there is an intermediate to your bacterial flagellum. How come you didn't bring that up?" "Well," Mr. Behe said, feigning ignorance about how evolution works, "that other bacteria uses the structures for a different function, so that's not true evolution." Our lungs evolved from the swim bladder of fish. Fish used the air for floating, and with some waves and tubes added, their descendants have used it for breathing. Our anvil and stirrup, bones of the ear, evolved from two of the three bones that reptiles have in their jaw. Interestingly enough, one purpose of the three-boned reptile jam is flexibility for swallowing food. A second purpose is hearing. Some reptiles can lay their jaw on the ground and use the very bones that evolved into mammalian ears for hearing. The fins of whales were once the feet of dog-like creatures. As an interesting aside, the feet of mammals evolved from the fins of fish, so in the case of whales, their fins have gone from one use, then to another, then back to the original use! The Evolution of a Creationist takes a look at animals that break all of the evolutionary "rules." It examines the many problems with evolutionary theory and shows why the Bible is an excellent book of science. This, of course, is not true. I say that because from 18 years of experience I can tell you that anti-evolutionists keep passing falsehoods from one to another that just wander down through the years without any creationist ever researching them. I didn't have to look to know that his statement wasn't true, but I did anyway. This page explains how the Bombardier Beetle's defensive spray really works. It explains the reductions that explain its possible evolutionary past, using defensive mechanisms found in other beetles and arthropods, including beetles related to Bombardier Beetles. Did you know that there are several species of this beetle that have varying methods of spraying their unpleasant mixture? Probably not, and no creationist is going to tell you that because it would make the idea of Bombardier Beetle evolution less incredible. You have to go to evolution web sites to get the whole truth, complete with references to peer-reviewed journals. The article I linked above explains that the Bombardier Beetle does not use an inhibitor to prevent the mixture from exploding. In fact, it doesn't explode at all. It becomes boiling hot, and the pressure from the heat forces the spray out of the beetle's tail. Of course, how that works varies from species to species. Not all species make their mixture that hot. That leaves open the obvious possibility that the mixture, distasteful to predators anyway, has been getting hotter and hotter over time, just the sort of thing evolution would predict. The article also asks an interesting question: "One must wonder how much weight an argument of design carries if the people making it don't know what the design looks like." I don't really want to torture myself by reading the rest of the scientific ignorance written by this man with an "advanced science degree" in dentistry. If you want to go read the book, and you have questions about further chapters that you think are better than these first two, please feel free. You can always email me with the "Contact Me" button in the navigation bar on the left. I was once a young earth creationist. I was horrified to find out that "Christian" men were knowingly giving me bogus information to face atheists and evolutionists with. This page is an example of what I have consistently found from creationists for 18 years. For more examples of this, so that maybe you can share my horror and call these people to task for defaming the name of Jesus, see Lying for Jesus.